Back when we had a natural gas fireplace in our condo, I loved to light it when I first got up on a winter morning. No matter how grey the day it always made me feel better to see the glow. I thought I would miss it, but of course, we adapted to get what we needed. 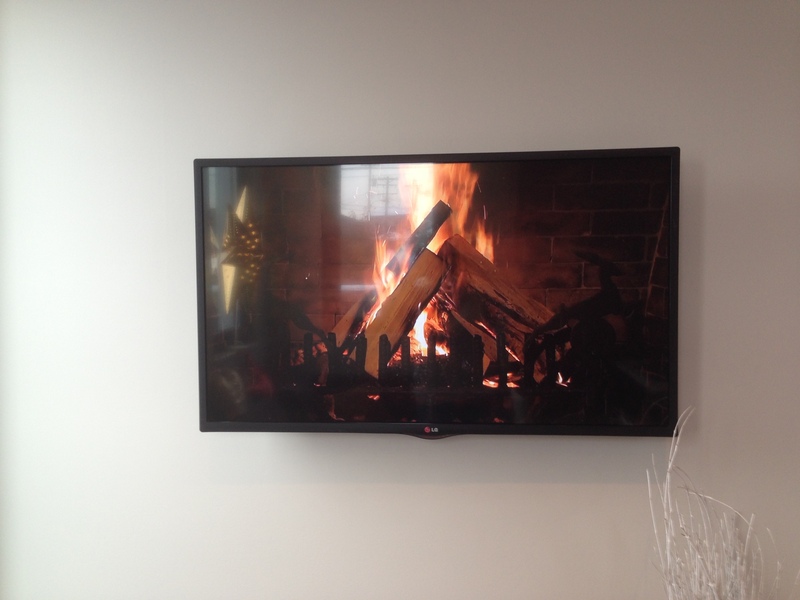 The cable company runs a continuous Yule log that we’ve got going all day. It looks toasty but it doesn’t make the room uncomfortably warm (as a real fire would). I’ve even recorded it so we can have it even when the Christmas season is over and we need that little glow in the evenings. Thank you, electric hearth. Over in the corner with the sectional we’ve put up an IKEA star and I’ve made some covers for our cushions that were a little more festive. And our Christmas tree? 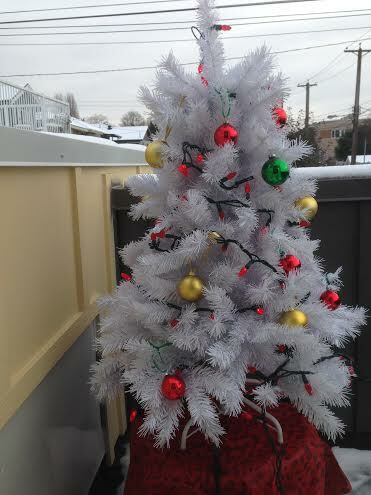 Well we don’t have room inside for a tree — so we’ve put it out on the deck. 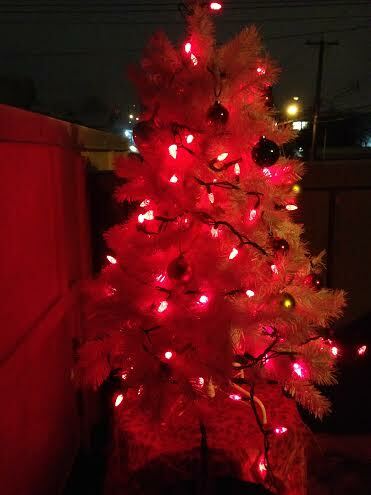 We’ve put outdoor lights on a white tree, set on our patio table. 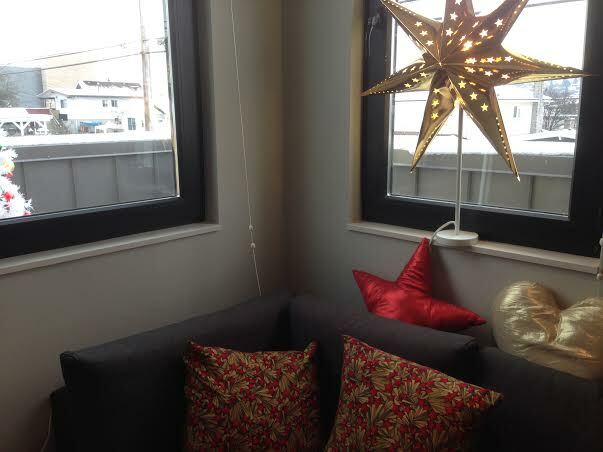 We can see it from our sitting area, and it just adds the right touch of Christmas. We’ve had some snow and that adds to the seasonal feeling, too. It looks especially nice in the evenings, when the lights glow through the “needles”. We’ve definitely had to cut back on the decorations from when we were living in a larger place, but that’s OK. We still get a Christmassy feeling, and we are so looking forward to Christmas day, and carrying our casserole (world-famous broccoli cauliflower souffle, recipe a la Susan Mendelson) across the yard to the big celebration, and being able to imbibe without worrying about getting on the road to get back home. The whole family will be there, including my sister, niece, old friends, and even an ex-spouse. We have so much to be thankful for this year. We have this beautiful home that we love so much, and we are so close to the people we love so much. There have been some tough times, too, and I am missing my parents a lot, but somehow being in this new house with new traditions makes it easier. And we hope everyone is having the best holiday season ever! Posted in Decorating, Laneway House, Small House and tagged Decor, Lane house, Laneway House, Small Style. Bookmark the permalink.